Say yes to Apple Pie Cheesecake with Caramel Topping for a sweet ending to your holiday meals, and be prepared to be blown away by all of the flavorful layers and textures tucked into this delicious dessert! 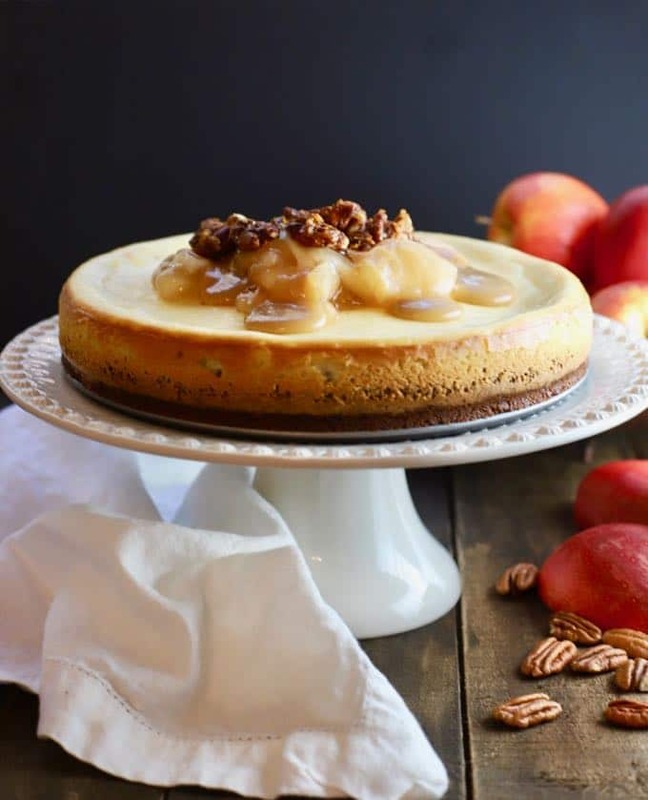 If you are looking for the best Thanksgiving or Christmas dessert, I have the perfect recipe for you, Apple Pie Cheesecake with Caramel Topping. If you are a dessert lover, just the name alone should be enough to make you swoon! 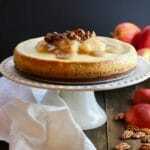 Never have to choose again between an old-fashioned apple pie and a rich and creamy cheesecake! It’s the perfect marriage of two classic desserts and a sweet and decadent dessert dream come true. Apple Pie Cheesecake with Caramel Topping all starts with a crunchy gingersnap crust, which is topped with a layer of canned apple pie filling. Next comes the luscious cheesecake mixture. But wait, there is even more deliciousness. 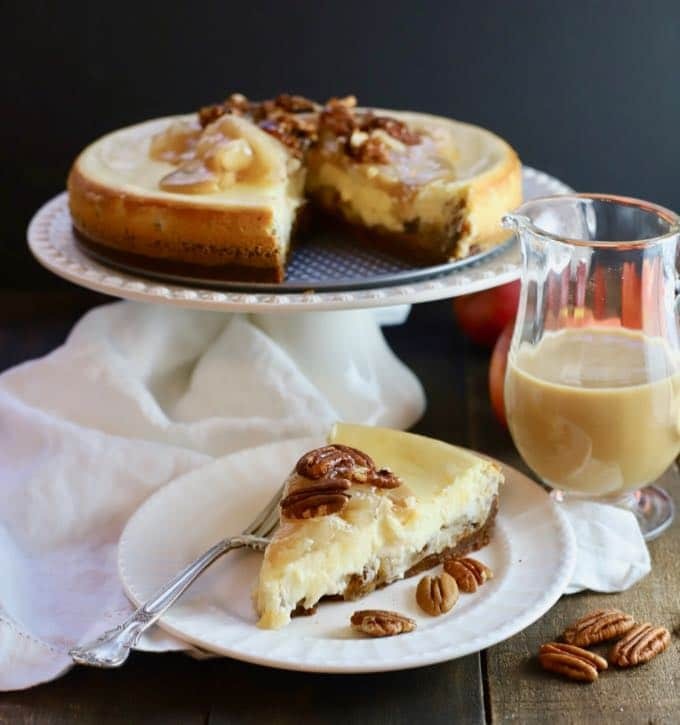 This delicious cheesecake is then topped with more apple pie filling, a smooth and creamy, homemade caramel sauce, and yummy toasted pecans. 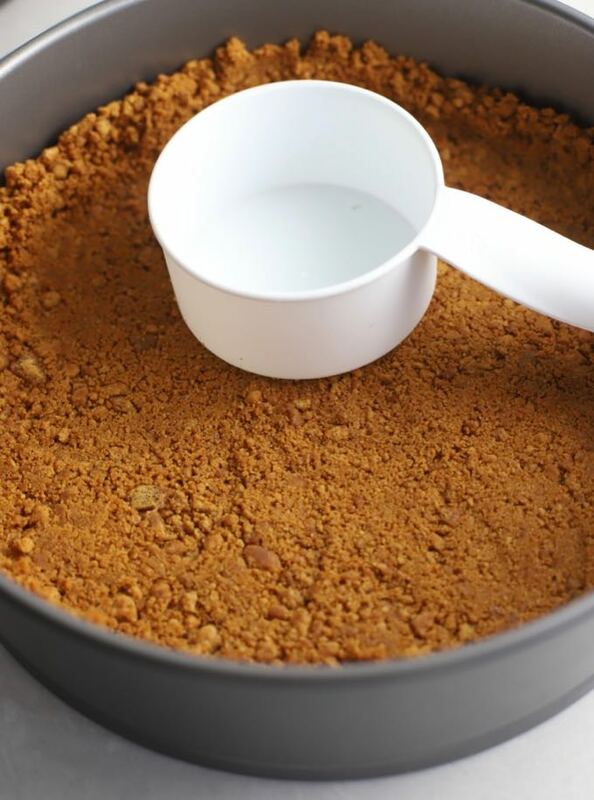 To begin, you will need to make the Gingersnap Crust. You will also need a springform pan. A springform pan is a 2-piece round cake pan with an easily removable bottom, which is held in place by sides which can be loosened with a clamp. It is most often used to make cheesecakes. If you don’t have a springform pan, you can use a regular cake pan, but you will need to leave the cheesecake in the pan and just cut the slices out of it. 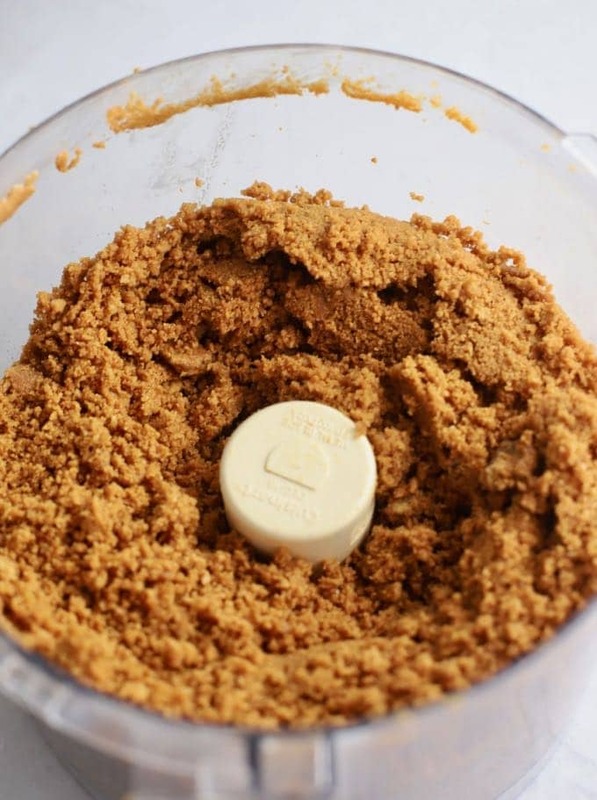 To make the Gingersnap Crust you must first preheat the oven to 350 degrees F.
While the oven is preheating, place the cookies in a food processor fitted with a steel blade and process until the cookies are fine crumbs. Add melted butter and process until well mixed. Pour the crumb mixture into a 9-inch springform pan and spread out evenly. Use your hands or the bottom of a flat measuring cup and press the mixture firmly onto the bottom of the pan. Wrap a double layer of aluminum foil around the outside and over the bottom of the springform pan and bake the crust for 9-10 minutes. Remove from the oven and place on a wire rack to cool while you make the cheesecake. 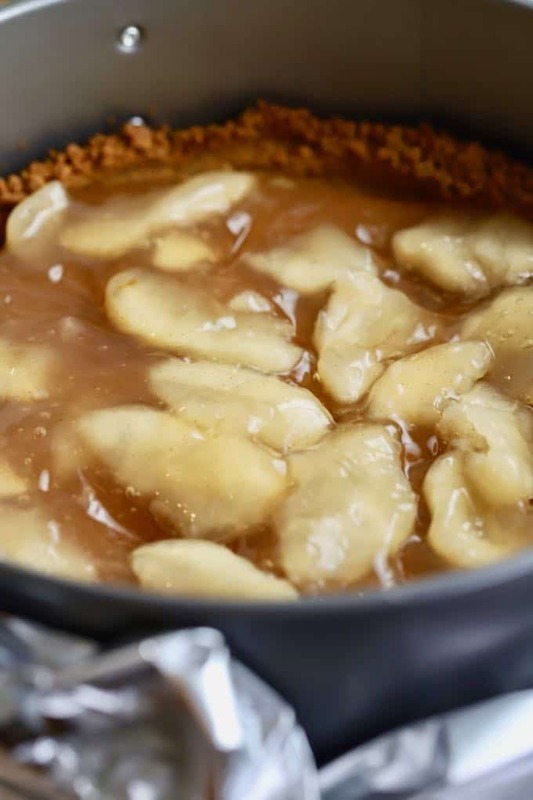 To make the Apple Pie Cheesecake spoon all but 3/4 cup of the apple pie filling into the gingersnap crust. Spread out evenly. Add the cream cheese, sugar, and vanilla to a medium size bowl and beat with an electric mixer until smooth and creamy. Pour this mixture over the apple pie filling. Bake for 35 minutes, or until the center of the cheesecake is set. Allow the cheesecake to cool. 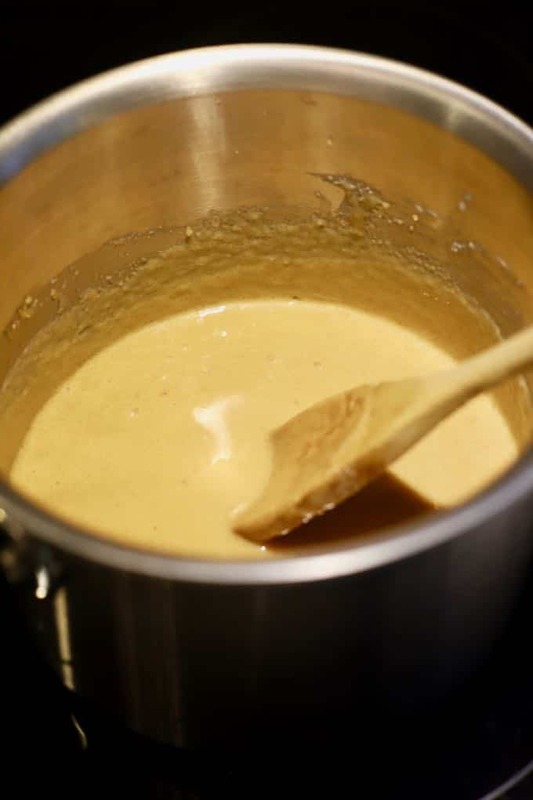 While the cheesecake is cooling make the caramel sauce by mixing the brown sugar, half-and-half, butter, and salt in a small saucepan over medium-low heat. Cook for about 5-7 minutes or until the mixture thickens slightly. Add the vanilla and cook for another minute or so. Allow the sauce to cool completely. Sprinkle pecans over the top of the apple pie filling and caramel sauce. Cover and refrigerate until ready to serve. You can substitute graham crackers, vanilla wafers, sugar cookies or Biscoff cookies for the gingersnap cookies. 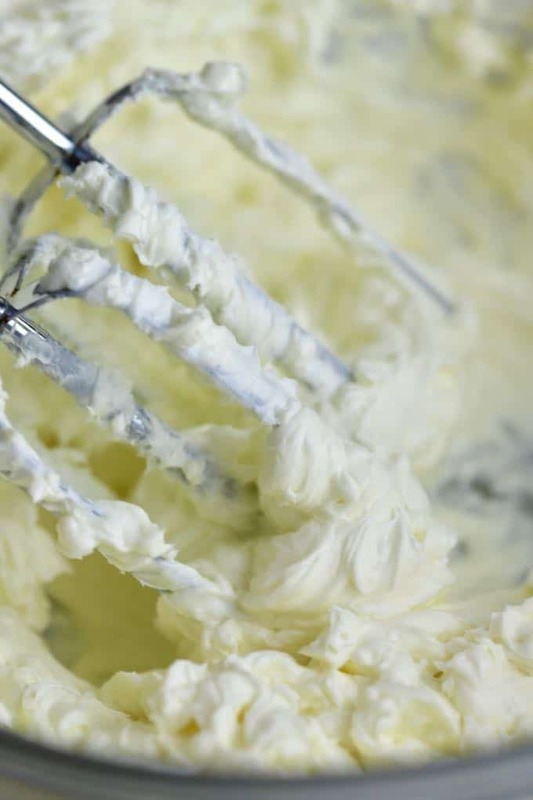 For the best consistency, make sure the cream cheese is at room temperature, before mixing. Simply place it unopened on the counter for 30-60 minutes or use your microwave and place the completely unwrapped cheese on a microwave-safe plate and microwave it on high for 15 seconds. Store the cheesecake covered tightly in the refrigerator for up to 5 days. To protect it, I always put the springform pan sides back on and then just cover it with aluminum foil or plastic wrap. In the unlikely event, your springform pan may leak, it’s a good idea to wrap a double layer of aluminum foil around the outside and over the bottom of the pan. In the event you have leftovers, you will be happy to know you can freeze this cheesecake. To freeze, place the cooled cheesecake on a baking pan and freeze, uncovered, until firm. 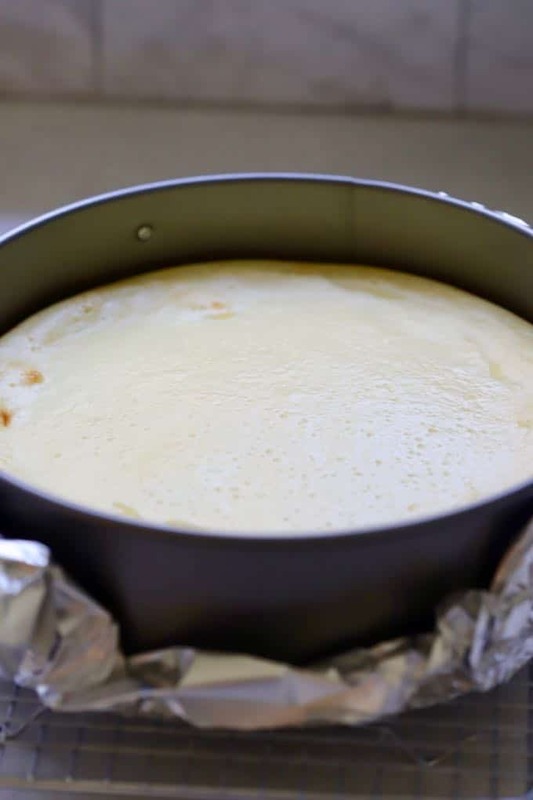 Remove the cheesecake from the freezer, wrap it in heavy duty aluminum foil and place in a plastic freezer bag. Before serving, thaw the cheesecake in the refrigerator overnight. 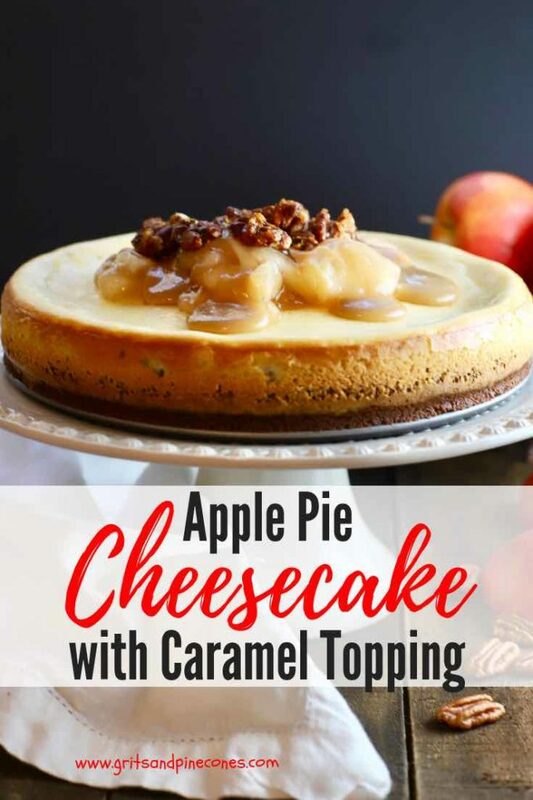 Say yes, to Apple Pie Cheesecake with Caramel Topping for a sweet ending to your holiday meals, and be prepared to be blown away by all of the flavorful layers and textures tucked into this delicious dessert! Place the cookies in a food processor fitted with a steel blade and process until the cookies are fine crumbs. Add melted butter and process until well mixed. Bake for 9-10 minutes. Remove from the oven and place on a wire rack to cool while you make the cheesecake. Spoon all but 3/4 cup of the apple pie filling into the pie crust. Spread out evenly. Add the vanilla and cook for another minute or so. Allow to cool completely. 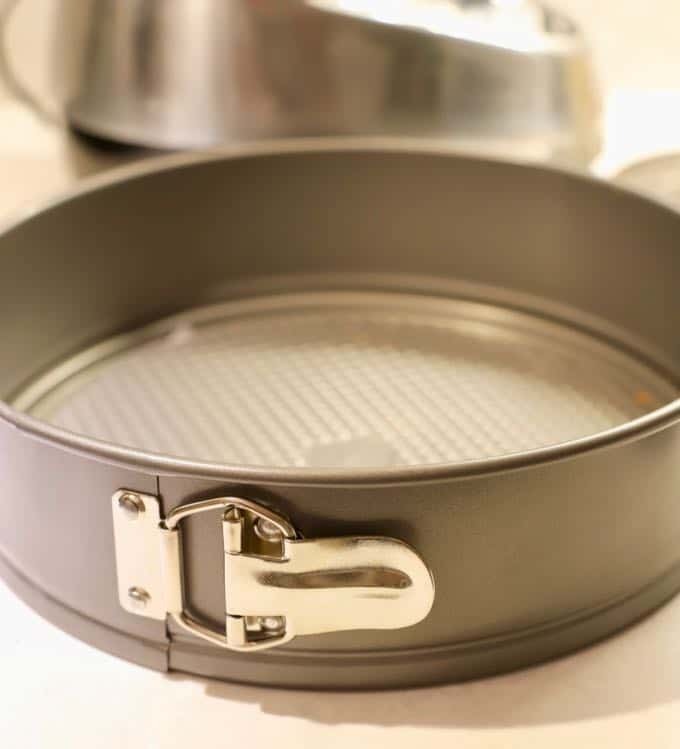 A springform pan is a 2-piece round cake pan with an easily removable bottom, which is held in place by sides which can be loosened with a clamp. It is most often used to make cheesecakes. If you don't have a springform pan, you can use a regular cake pan, but you will need to leave the cheesecake in the pan and cut the slices like a pie. You can substitute graham crackers, vanilla wafers or Biscoff cookies for the gingersnap cookies. Store the cheesecake covered tightly in the refrigerator for up to 5 days. I always put the springform pan sides back on and then just cover it with aluminum foil or plastic wrap. In the unlikely event, your springform pan may leak, it's a good idea to wrap a double layer of aluminum foil around the outside and over the bottom of the pan.